One replacement visor. 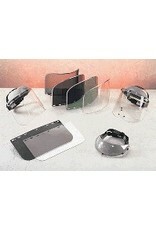 Easy ratchet adjustment system adds comfort and easy visor replacement. A "turn button" visor attachment holds 12in. visors firmly.